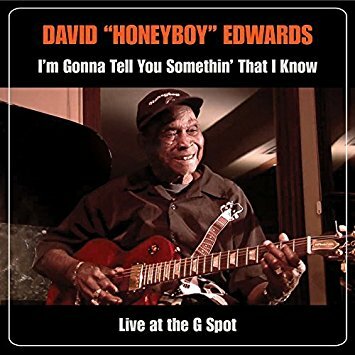 David “Honeyboy” Edwards, (1915-2011), may have been the last of the original Delta Bluesmen. He was born in Shaw, Mississippi, in 1915, and left home at the age of 14 to play the blues. He traveled with Robert Johnson for a number of years and was present when he drank poisoned liquor. He continued to perform until his death at the age of 96. Omnivore Recordings has now released his last recorded concert as a two-disc DVD and CD set. At 95 years of age, Honeyboy performed a nine song set at the G Spot in Los Angeles, September 4, 2010. Backed by Jeff Dale & The South Woodlawners, he gave one of the last authentic concerts of the Delta Blues. The CD and DVD contain the same material with two notable exceptions. The CD contains an extra band version of ‘That’s Alright.” The DVD includes twenty minutes of Edwards telling stories about music, Johnson, Charley Patton, and more. The recording equipment was modern day, so the sound and video quality are excellent. The performance was filmed for release, so it has a cohesive feel. His song-set is a mix of originals and covers that span the decades. The backing band is capable and is wise enough to stay out of his way, although by just being there they lesson the primitive aspect of his original music a bit. Edwards was 95 years old at the time of the performance and his voice, while not as powerful as in his prime, remains effective. His guitar technique is still evident and the film pays some attention to this part of his legacy. “Ride With Me Tonight,” “Little Boy Blue,” “Catfish Blues,” and “Sweet Home Chicago” are stripped to their essence. While Edwards may need a little more help than in the past, his roots are still on display. I’m Gonna Tell You Somethin’ That I Know is about as modern as Honeyboy Edwards ever gets. It is an album for people who long for music from a different and now by-gone time. This entry was posted on Monday, July 10th, 2017 at 2:16 pm and is filed under Music DVD Reviews, Music Reviews: Everything Else. You can follow any responses to this entry through the RSS 2.0 feed. You can leave a response, or trackback from your own site.